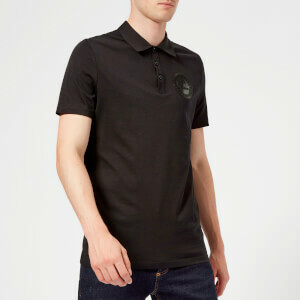 Men’s black polo shirt from Versace Collection. Crafted from woven piqué cotton, the polo shirt features a polo collar in contrasting fabric with Versace’s signature Greca key and baroque prints. Complete with a three-button placket, ribbed cuffs and the iconic half medusa head logo tab on the hem. Main: 100% Cotton. Collar: 50% Cotton, 50% Polyester.